A symposium was held in the Mekong Delta city of Can Tho on May 9 seeking to remove institutional barriers to spur local socio-economic development during the national industrialization and modernization. Vietnam has implemented the renewal process for 30 years, but, its economic development has fallen short of expectation due to economic institutional barriers. Experts pointed to the need to correctly identify economic institutional barriers along with acquiring international experience to realise the nation’s goal of industrialization and modernization. From the local angle, representatives from the Institute for Socio-economic Development Studies in Can Tho said economic institutional barriers have created “bottlenecks” in the city’s economic development, such as the declining investment from 60.26 percent to 50.7 percent in 2006-2010 and 2011-2015. The Incremental Capital-Output Ratio (ICOR) continuously increased from 2.3 in 2002 to 4.5 in 2012, indicating the ineffective use of capital and imbalanced transfer of labour and economic restructuring. The total-factor productivity (TFP) tends to slow down on-year, which stood at 22.94 percent in 2006-2010 and 24.5 percent in 2011-2015. Other bottlenecks include difficulties in attracting foreign direct investment (FDI), low-quality business environment, weak logistics systems, and small-scale service businesses. To address them, the institute suggested implementing more effectively the Politburo’s Resolution 45 on building an industrial city with the Mekong Delta playing the central role and the southern key economic zone playing the leading role. It is also necessary to develop infrastructure, airports, seaports, transport systems, trade services, and start-ups, while joining the global supply chain to expand exports and launching direct air routes to other Asian countries to promote tourism and lure investment. Apart from taking advantages of science-technology centres, Can Tho should focus on investment in high-quality human resources to provide skilled workers for the Mekong Delta and labour exports. 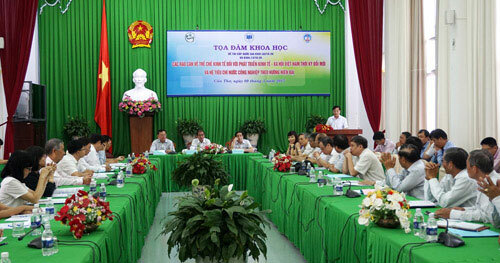 Nguyen Minh Toai, Director of the Can Tho Department of Industry and Trade voiced concerns about asynchronous legal regulations, causing difficulties for socio-economic activities./.